Michelle Obama was greeted to tens of thousands of revelers and fans during her visit to London on Sunday evening, where she promoted her bestselling memoir “Becoming” over the weekend. At an event that was emceed by comedian and “Late Show” host Stephen Colbert at the O2 Arena in London, Obama spoke about her time in the White House, as well as her storied life prior to becoming first lady, before more than 15,000 of her fans. Colbert asked Obama what she thought of the crowd’s jubilant reaction to her visit. The memoir Obama penned has sold nearly 10 million copies worldwide, according to reporting from Fox Business. The feat makes it probable that Obama’s book is the bestselling memoir across the globe of all time. Obama, who noted that a lot of people felt anxiety over the current state of politics, held an optimistic viewpoint for much of the time during her London event. She reminded people in the audience that, while things in American politics may seem glum now, the fact that the country voted twice for her husband to be president was reason to believe things could be better again. “That really did happen. That wasn’t make-believe,” Obama said. “We have to remember that what is happening today is true, but what happened before was also true…that should give us some solace at some level,” she added. Colbert took the opportunity to crack a joke. “He wore a tan suit once,” he said, referring to the reaction from right-wing media after former President Barack Obama wore such a suit during a press conference while he was in office. Besides London, Obama’s “Becoming” book tour has taken her to many other places in Europe, including Amsterdam, Paris, Oslo, Stockholm, and Copenhagen. 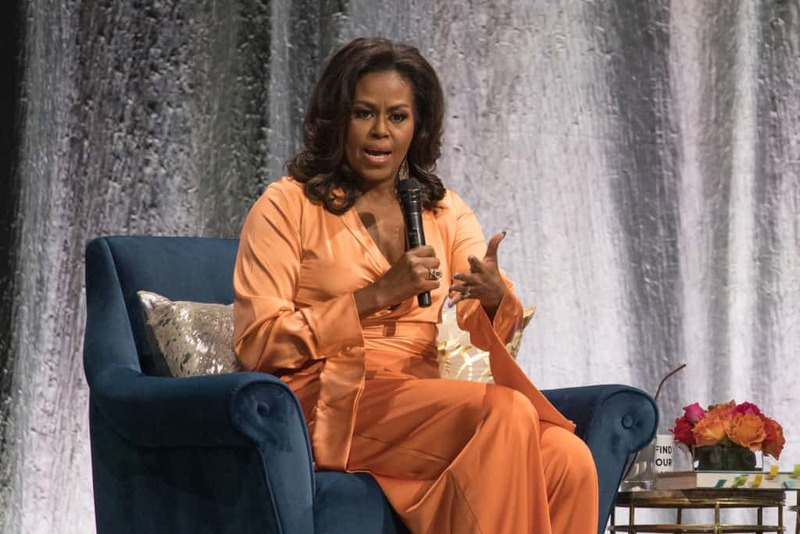 The former first lady has also already completed a North American tour, making stops across the U.S. and Canada before she traveled across the Atlantic.